After four weeks of spirited voting, USA TODAY readers have named Six Flags Magic Mountain’s Fright Fest the Best Theme Park Halloween Event in the country for the second consecutive time. Halloween celebrations continue to gain popularity across the United States and Six Flags Magic Mountain sits in one of the most competitive theme park markets in the world. Over the last seven years, the 260-acre Los Angeles theme park has upped the scare factor and quality to an entirely new level with multi-year, multi-million dollar investments resulting in rave reviews from guests. Now touting some of the most creative and outlandish Halloween attractions in the country, Six Flags Magic Mountain’s 2017 lineup is the biggest and scariest in the park’s history featuring 13 electrifying mazes and dare-to-enter scare zones—including some of the most unique scare zones ever—new shows, haunted rides and attractions, and extraordinary roving “scare-actors.” And now, due to its huge popularity and increasing demand, the park has expanded the calendar to a record 21 days of operation. Six Flags Magic Mountain’s sister parks, Six Flags Over Texas, located in Arlington, Texas, and Six Flags Fiesta Texas in San Antonio, Texas, were also named one of America’s best scream parks, coming in sixth and 10th place respectively, making Six Flags Fright Fest a coast-to-coast powerhouse. 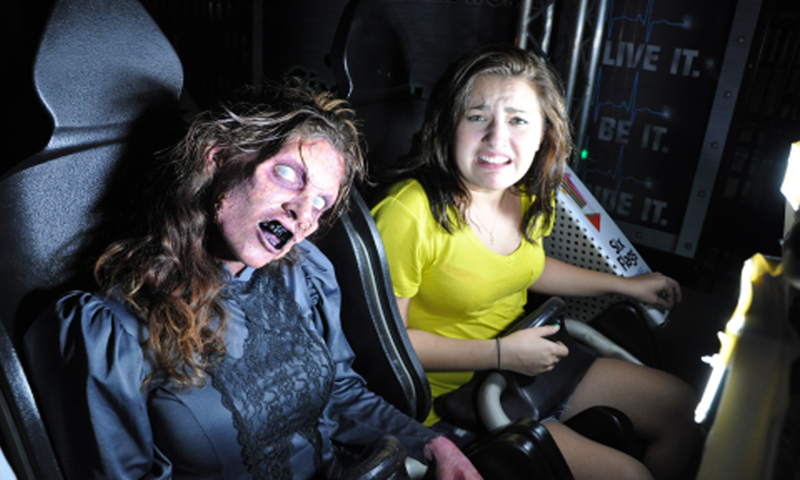 Fright Fest is hosted by all 13 Six Flags theme parks. To see the complete list of USA TODAY winners in the ‘Best Theme Park Halloween Event’ contest category, visit http://www.10best.com/awards/travel/best-theme-park-halloween-event-2017/. Six Flags Magic Mountain celebrates its 25th season of Fright Fest with an exciting line-up of new haunted attractions this year including a new scare zone in the Park’s newest themed area, Metropolis, new maze, a new Haunted VIP Tour and new in-park dining and entertainment options. The expansion also includes more roving “scare-actors” than ever before and additional Fright Fest nights, bringing the total to a record 21 event days. The award-winning “Scream Park” leaves no tombstone unturned to deliver what guests want most…an all-out terrifying experience. The park also adds a sinister element to some of its renowned monster coasters by turning off the lights, leaving riders to face their fears in total darkness–literally. Plus, back by popular demand, Suicide Squad: The Six Flags Fright Fest Experience transforms the Park’s DC UNIVERSE area into DC’s Midway City, where some of the “Worst Heroes Ever” from the highly-acclaimed film Suicide Squad roam the streets. Darkness and chaos reign as some of DC Comics’ most famous Super-Villains, including Katana, Killer Croc, The Joker, and Harley Quinn, are found among the mass destruction depicted in the film. State-of-the-art digital imagery and fiery special effects create an inferno as buildings burst into flames and creatures attack from every angle. “It feels good to be bad” at Suicide Squad: The Six Flags Fright Fest Experience. Two new haunted attractions this year incorporate state-of-the-art makeup, props, and special effects. The new scare zone, Damned ‘N Disguise: Change Before Your Eyes, adds to this year’s horror-filled offering of haunts as the City of METROPOLIS™ is transformed into Magic Mountain’s first-ever, right-in-front-of-your-eyes morphing masquerade! Dead End, is a new maze sure to raise a few hairs as it lures guests into the meandering, eerie hallways, leaving them to fend for themselves in the dark. Also new this scream season is Club 6-feet Under, a frightfully fun night club experience where guests enjoy devilishly delicious food while a demonic DJ spins hot jams until the wee hours of the night. Additionally, guests can enjoy a meal in the company of creepy creatures, spooky fun and monstertainment every day at the Ghoulish Grub at the Pub, located in Metropolis. The new Hidden Haunts VIP Tour takes guests to areas around the park that no one dares to enter to hear real-life haunting tales. Plus, guests are able to get their fill of thrills and chills with front-of-the-line access to all mazes, rides and attractions. It is the ultimate VIP experience. Also returning in 2017, the region’s largest outdoor maze ever built, Aftermath 2: Chaos Rising. Covering more than 40,000 square feet, this massive maze strikes terror into the brave souls entering a post-apocalyptic city inhabited by nomad warriors who rule with bone-crushing iron fists and the dead stalk the living. Larger-than-life props, fire, fog and other special effects make this a must-experience maze. Three of the most popular mazes return to Six Flags and incorporate state-of-the-art props, Hollywood-quality make-up, and story lines not meant for the faint-of-heart. Enter the world of Red’s Revenge…over the river and through the woods, to Grandmother’s house you go, but in this fairytale, guests and the wolf are hunted by Red and her demonic minions. Vault 666 is an old abandoned research facility where genetic experiments crossing humans with animals were once conducted and just recently, the frightening secrets have been unearthed, exposing terror and mayhem from deep within the unsecured vault. Willoughby’s Resurrected is a reincarnation of the Willoughby family’s beloved haunted mansion that includes hair-raising horror down long harrowing hallways and around each nightmarish-turn. Another all-time favorite makes a comeback with its demented 3D twist, Toyz of Terror 3D, the defunct toy factory haunted by wicked windups, freakish furries and deranged dolls…and if that’s not enough to scare the wits out of even the bravest, guests are now forced to experience the madness in 3D terror. And, don’t miss Chupacabra, where guests come face to face with this elusive blood-thirsty creature as it petrifies the local Dia De Los Muertos (Day of the Dead) Festival. Spooktacular shows include the hypnotists, who put park guests in compromising scenarios in their hilarious stage show located in Golden Bear Theater, and the very popular VooDoo Nights, where Ghoul Rock has gone pop with a musical spectacular. Guests literally face their fears in the dark when the lights go out on some of the Park’s iconic coasters, including Twisted Colossus, Full Throttle, Tatsu, Viper, X2, Scream, Goliath, The New Revolution, and others during Fright Fest. Six Flags Magic Mountain, the undisputed “Thrill Capital of the World,” is located at 26101 Magic Mountain Parkway, Valencia, north of Los Angeles off Interstate 5 at the Magic Mountain Parkway exit. The Park opens daily at 10:30 a.m. For information call (661) 255-4111 or visit the website at www.sixflags.com/magicmountain.